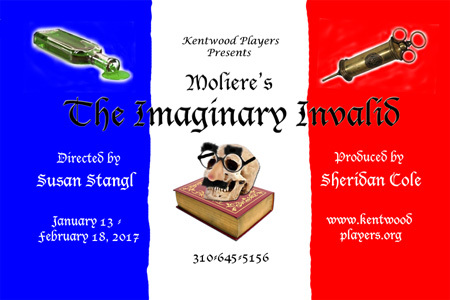 Molière's The Imaginary Invalid is an outrageous satire of medicine and its practitioners, sadly relevant even today, the wealthy Argan revels in poor health, relying on laxatives, suppositories, bloodlettings, and second and third opinions from the leading quacks. Although his daughter Angélique loves the impoverished Cléante, Argan wants to marry her to Thomas Diaforrhea, a medical dunce who can assure his father-in-law a lifetime of free health care. Aided by Argan's wily, back-talking servant Toinette, the young lovers contrive to meet despite the scheming of Béline, Argan's mercenary second wife. All is resolved (or is it?) when the clever Toinette and Argan's sage brother Béralde concoct a hilarious, elaborate plan to teach Argan where to place his trust. Angélique knows her stepmother Béline is up to something. Angélique and Cléante are able to meet again at last. Argan wonders if Fleurant’s potion will be expensive. Time for your daily enema, Monsieur. Argan gets his daily enema from Fleurant while Toinette waits with the bedpan. I’m not looking in there! In a pre-curtain speech Dr. Diafoirus, Thomas, and Purgon recommend Kentwood Players’ season tickets. Angélique tells Toinette of the young man she has met. Bonnefoi advises Argan how to evade inheritance law and leave his wealth to Béline. Thomas recites a florid prepared speech to Angélique. Cléante and Angélique profess their love in the guise of an improvised opera. Dr. Diafoirus and Thomas cluelessly examine Argan. Argan demands that Louison tell him about the young man she saw with Angélique. Béralde tells Argan that he is one of the healthiest people he knows. Under Béralde’s direction Argan himself is made a physician. The cast of The Imaginary Invalid.